Everything I Want to Eat: The New California Comfort Food from L.
Find the best price forEverything I Want to Eat: The New California Comfort Food from L.
The debut cookbook from Jessica Koslow, award-winning chef of LAâ€™s popular restaurant Sqirl, featuring more than 100 fresh, market-driven, healthy, and flavorful recipes. 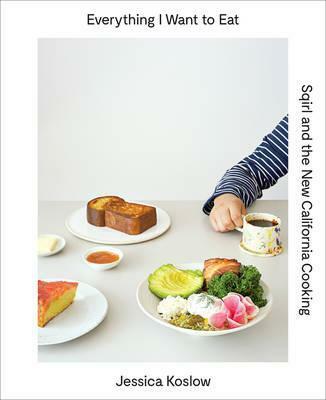 Jessica Koslow and her restaurant, Sqirl, are at the forefront of the California cooking renaissance, which is all about food that surprises us and engages all of our sensesâ€”it looks good, tastes vibrant, and feels fortifying yet refreshing. In Everything I Want to Eat, Koslow shares 100 of her favorite recipes for health-conscious but delicious dishes, all of which always use real foodsâ€”no fake meat or fake sugar hereâ€”that also happen to be suitable for vegetarians, vegans, or whomever youâ€™re sharing your meal with. Koslow lives in LA, where everyone is known to be obsessively health-conscious and where dietary restrictions are the norm. People come into Sqirl and order dishes with all sorts of substitutions and modificationsâ€”hold the feta, please, add extra kale. They are looking to make their own healthy adventures. Others may tack breakfast sausage, cured bacon, or Olliâ€™s prosciutto on to their order. So Koslow has had to constantly think about ways to modify dishes for certain diets, which in a way has made her a better, more adaptable cook. Throughout this book, Koslow provides notes and thought bubbles that show how just about any dish can be modified for specific tastes and dietary needs, whether it needs to be gluten-free or vegan. Everything I Want to Eat captures the excitement of the food at Sqirlâ€”think of a classic BLT sandwich turned playful with the substitution of chicken skin â€œbaconâ€â€”while also offering accessible recipes, like tangerine and rosewater semolina cake, that can be easily made in the home kitchen. Moreover, itâ€™s an entirely new kind of cookbook and approach to how we are all starting to think about food, allowing readers to play with the recipes, combining and shaping them to be nothing short of everything you want to eat. Compare New Book Prices for Everything I Want to Eat: The New California Comfort Food from L.